Above Right: Clerestory windows bring additional light into the space while black river rock placed on both sides of the floor to ceiling glass windows blur the line between the interior and exterior. Right: The great room combines the kitchen, living, and dinning spaces all into one large entertaining room. A 30 foot motorized door retracts opening the great room to the outdoor patio and pool area. 40 miles of sprawling desert views stretch out from beyond the pool's negative edge. 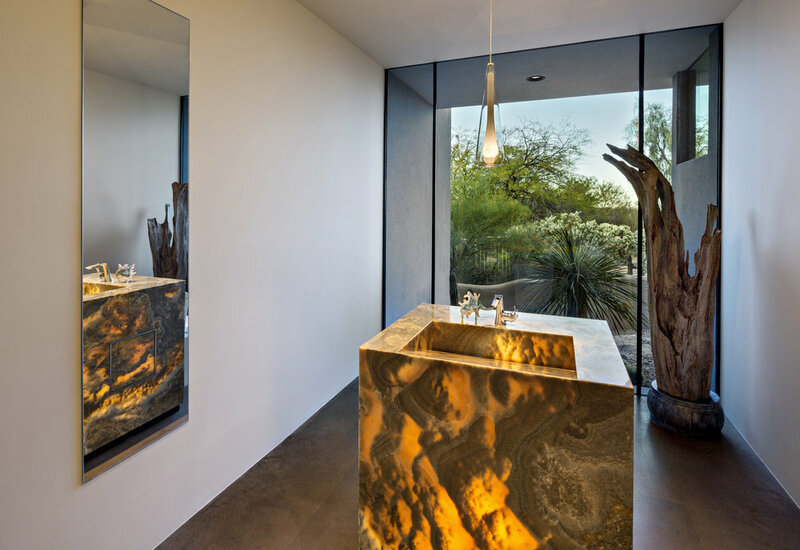 Below Left: In the powder room, a freestanding back-lit onyx sink looks directly out at the desert landscape. A piece of driftwood in the corner brings an organic shape to the space. Above Left: Cantilevering copper trimmed roofs extend from the house. 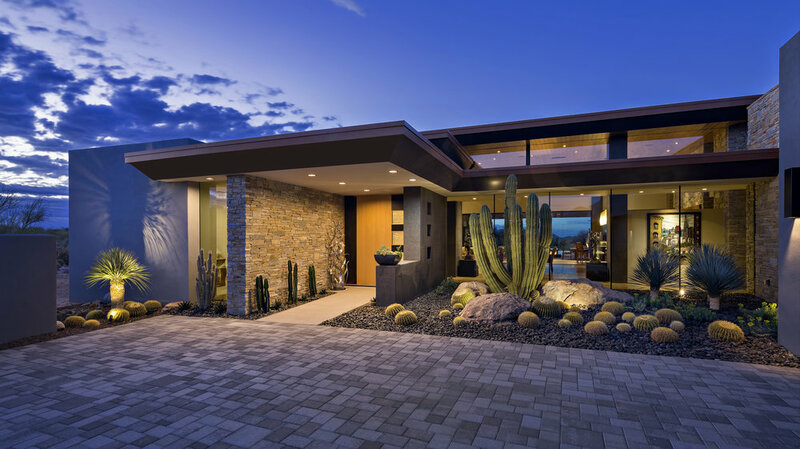 Desert trees and cacti blend the house into the Sonoran landscape. Above Right: The house makes a U-shape centered around the large patio and black water infinity pool. The house contains all the elements of a great backyard: a place to be in the sun, a place to be in the shade, and a place to be in the water. 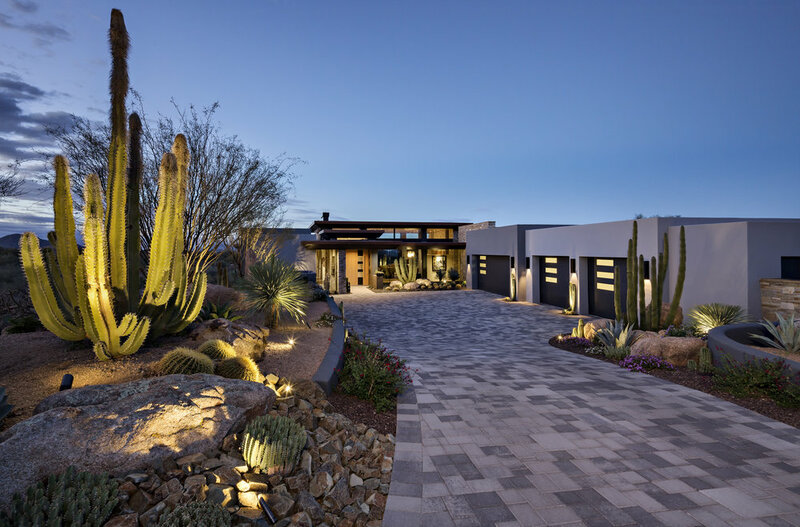 Left: The basalt negative edge pool and elevated spa reflect the cantilevering roofs, sky, and desert surroundings. A long low fire pit stands next to the spa. Golden barrel cacti, a large organ pipe cactus, agave plants, and black river rock fill the planter to the left of the pool.